Are you boring with common fried chicken? Why don't you try this Green Chicken Recipe ala Indonesia? It'very easy to make and you don't need so much time to make it. 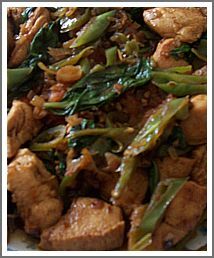 This chicken recipe is not really hot despite we use the green chilies. One thing you have to know is that green chilies are not so hot as red chilies. So, this recipe could be suitable for everyone. We use much Kikkoman light soya sauce because this soya sauce hasn’t fishy smell like other light soya sauce. It's dark in color, so it's very suitable for this chicken breast recipe. Coat the chicken with some salt and tamarind water. Let stand for about 15 minutes until the flavors have been absorbed. Heat the oil in a wok and fry the chicken until they are golden brown. Remove and set aside. Heat some sesame oil in the wok pan and add garlic and shallots, stir it until fragrant. Add the fried chicken and stir it until the chicken coated with the mixture. Add green chilies, tomatoes, chinese wine, and kikkoman soya sauce. Stir it for a few minutes. And add Basil for the last thing. Enjoy your delicious meal with some white rice.